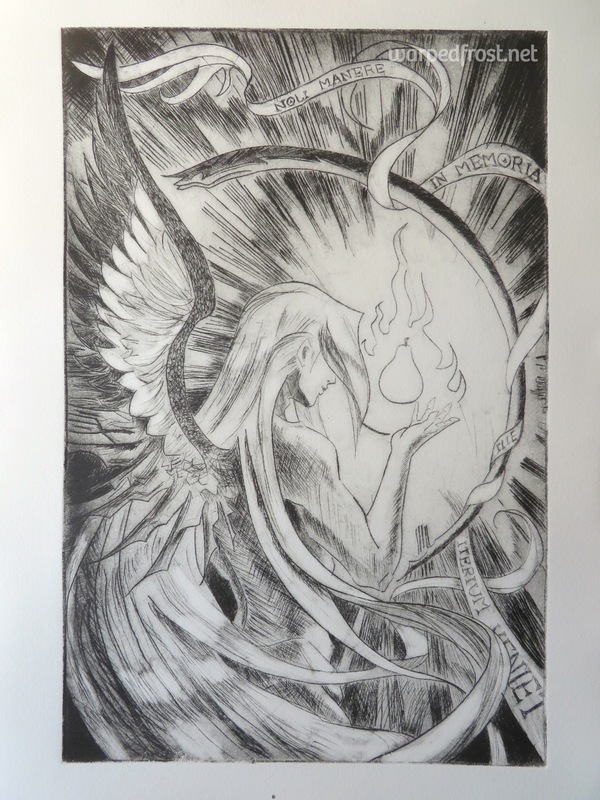 With this year being the 20th anniversary of Final Fantasy VII, I used one of my projects in printmaking last spring to pay homage to Mr. Lash Blast by Covergirl Jenova. 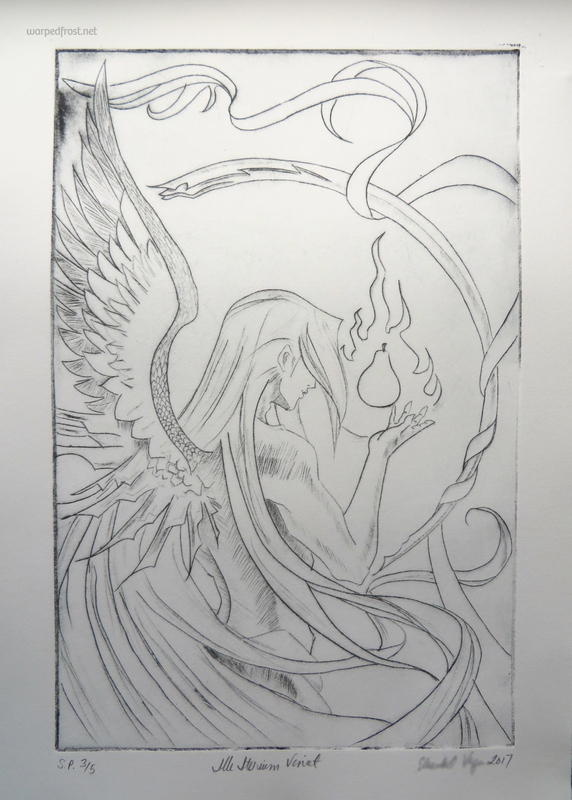 The assignment was drypoint etching. We had to work the plate gradually, pulling prints as we went. I didn’t really make good use of that aspect of the assignment as I had a final image in mind. I didn’t realize that until I saw a classmate’s piece; each of the 5 prints in her series seemed to show the progression of a house’s fall into ruin. My piece was clearly just “let me see where I can hold off on details to be able to get five separate stages in print.” Even so, I’m fairly happy with the way these turned out. The inked plate around State 3. 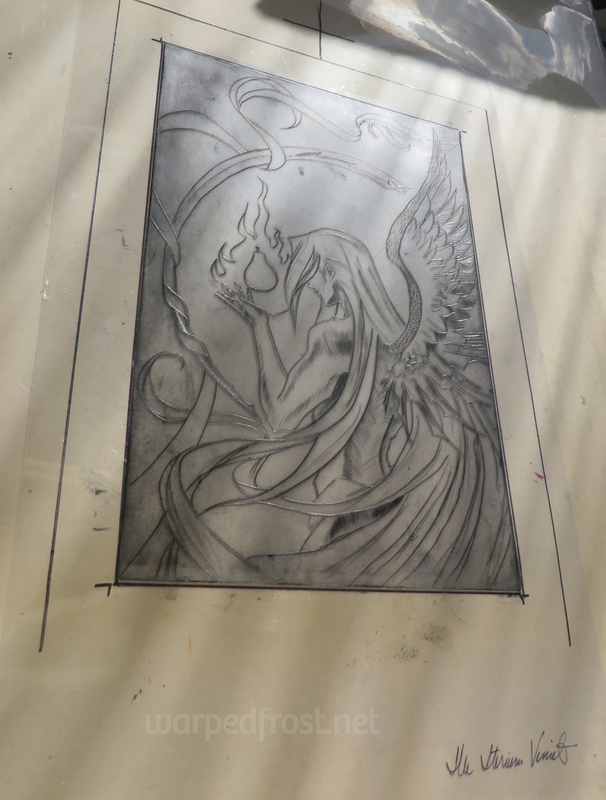 I used an Akua etching plate, which was softer than the polycrylic plates in stock in the studio. That was as far as I got in the class. I was mostly satisfied with it even though it didn’t really POP. I liked the lines. But, I went into it a little bit more anyway on my own time later. The plate inked up and ready to go after many more lines were added. 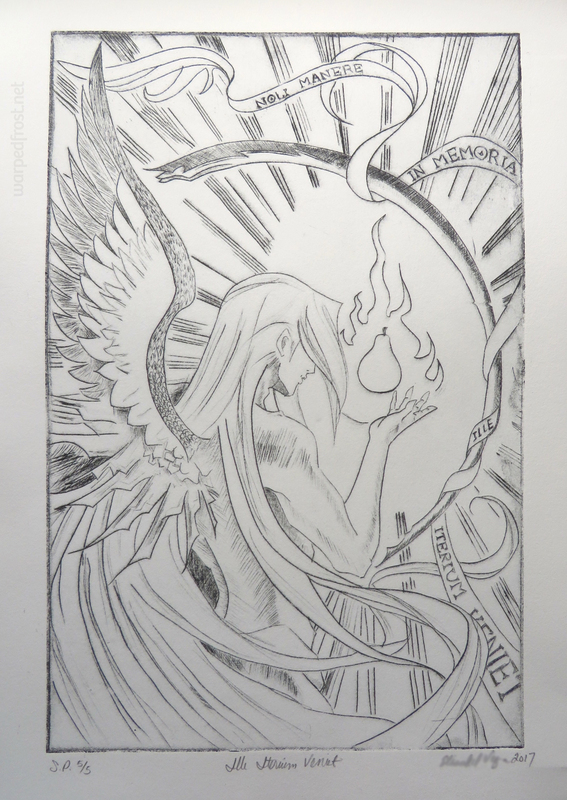 I didn’t particularly like the inking process for this kind of printmaking but I did like the results. Or rather, I liked that I could make something that was close to what a pencil drawing would be. But all that dabbing away with tarlatans, and then with Q-tips…what a meticulous and time-consuming process! I think it took me 30 minutes to pull one print between inking and wiping. Unfortunately each one came out a bit different…a hazard of the ink-wiping process (in the hands of an amateur such as I anyway). 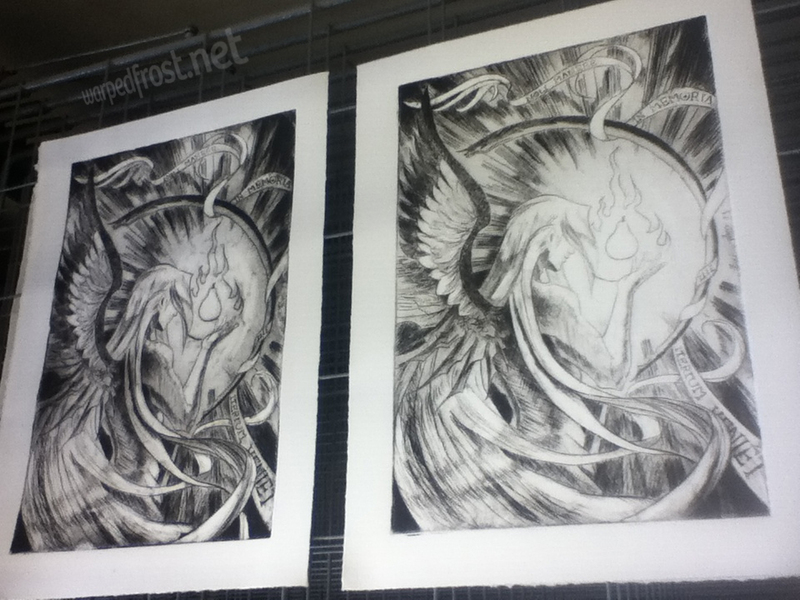 I’m still technically not done with this, because there are stray scratches visible in the two best prints I pulled. I contacted my teacher for advice, asking whether I should just ink the light prints by hand with a pen, or try to erase the stray marks off the page from the better prints. She said it wouldn’t really be a print anymore if I did too much with pen, but that it could be considered a mixed media piece. I’m thinking of going the eraser route. 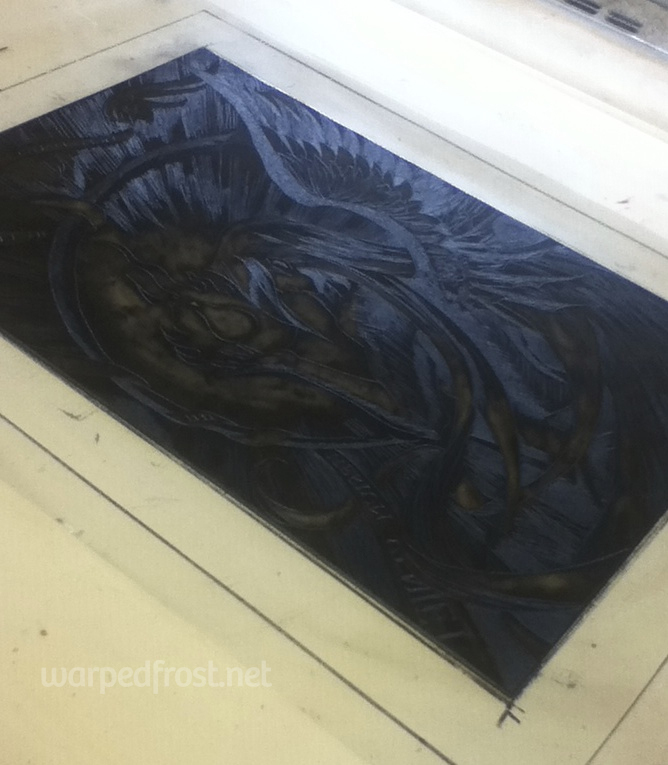 Tags: Drypoint, Etching, FFVII, Final Fantasy VII, Printmaking, Sephiroth. Bookmark the permalink. Makes me wonder what other language-specific FFVII puns are out there. That works too. It’s silly on several levels! Thank you for visiting Warped Frost! I hope you enjoy your time here. So far I've tackled some really long translation projects, and given how much work I put into them, and the fact that I am NOT making money off of this (notice the lack of ads?) I want these translations to stay exclusively on Warped Frost. I'm glad if people read my translations, of course, and don't mind being linked to. Same goes for my artwork and photographs. I thought this was a damselfly, but fellow Michiganders informed me that it was a fish fly. Thanks to all who helped me identify this insect! Send sparkling snowflakes my way!